One of 12 children of a poor fisherman, Ms Santhirabose, now 34, says she volunteered to join the Liberation Tigers of Tamil Eelam when she was 15, along with three of her siblings, and married another fighter when she was 20. Her parents now live in Canada; several siblings are in France. As a registered ex-combatant scratching a living from farming, she says she is watched by the authorities and discriminated against. She still has shrapnel in her head from an old wound. Her loyalty to the Tigers' cause and to its leader, Velupillai Prabhakaran, who was killed in the final battle, is unshaken. She says she has no regrets about joining up, despite Prabhakaran's record of brutality: the Tigers suicide-bombed buses and banks, forcibly recruited children and routinely assassinated any perceived foes, Tamil and Sinhalese alike. "The war was lost only because he was betrayed," she laments, citing a close lieutenant who defected with several thousand fighters in 2004. "In those days," she says, "life was good. We slept safely. No crime. We had our own economy." Like many Tamils, she suggests that foreign governments should intervene. 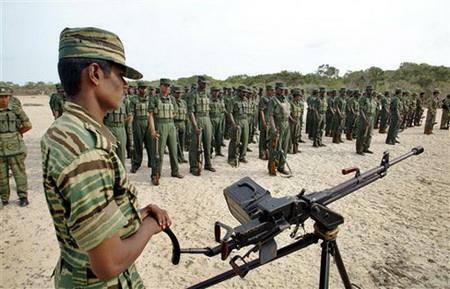 "Does the world think it is right for the Tamils to be treated as slaves?" 例句:I never regretted joining up. I think I did the right thing. 例句:Some foreign governments appear happy to gloss over continued human rights abuses. 例句:He says he has no regrets about his surgeries.